Dental Veneer Bangkok At Smile Inter Dental Clinics. Bangkok, Thailand, the place where you can absolutely trust for our sevices. At BANGKOK SMILE DENTAL CLINIC @ Sukhumvit 5, dental veneer Bangkok our porcelain veneer or porcelain laminated veneers are produced in our own in-house laboratory. They are a thin shell of porcelain / ceramic that is bonded onto the front surface of a tooth so as to improve its cosmetic appearance. They will repair teeth that are discolored, worn down, chipped or damaged, misaligned or irregularly shaped. They are translucent, thin laminates, individually made to improve the esthetics (shape, spacing and color) of your natural teeth, to replace composite bonding or to correct crowding. At our BANGKOK SMILE DENTAL CLINIC @ Sukhumvit 5 center of dental excellence, all porcelain veneer treatments will be done by our cosmetic dentists, who are all graduates of cosmetic dentistry. These experts are a major part of our practice. We are one of the very few dental clinics in Thailand with its own in house dental laboratory, so nothing has to be sent out to other laboratories, thus there are no unnecessary delays to your treatment and minimal intrusion into your visit to Thailand. Most dental clinics have to outsource these needs to separate facilities � sometimes even to other countries, giving you a more "mass manufactured," less personal result, rather than the personal, customized service and result that all our clients receive here at BANGKOK SMILE DENTAL CLINIC @ Sukhumvit 5, dental veneer Bangkok. At BANGKOK SMILE DENTAL CLINIC @ Sukhumvit 5 our hi-tech in-house laboratory combines the most up to date equipment with experienced, expert dental technicians, thus guaranteeing that all of our dental makeovers are made to exact, finite specifications. We can ensure that all dental works are customized to your special needs, produced quickly and efficiently, and offered at competitive prices. Here at BANGKOK SMILE DENTAL CLINIC @ Sukhumvit 5 we never compromise on any of these factors and guarantee ultimate satisfaction. Our dental veneers (sometimes called porcelain veneers or dental porcelain laminates) are wafer-thin (approx. 0,5 mm) translucent porcelain / ceramic facings made in our dental laboratory after an impression. 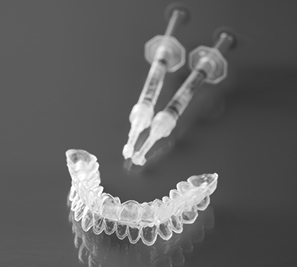 These are then bonded permanently to your tooth's front surface using a special adhesive process. The porcelain veneer covers the visible surface of the tooth completely. The chemical bond between porcelain and enamel creates a translucent, tooth-shaded unit with perfectly natural aesthetics. What advantages do ceramic veneers offer? Our custom made porcelain veneers provide a very natural tooth appearance. They mimic the light reflecting properties of your natural teeth and the characteristics of tooth enamel incredibly well. They can be made very thin and translucent. The colour of the porcelain veneer can be chosen to match your natural teeth very closely or to create a whole new natural look to your smile. In most cases it is not necessary to veneer all your teeth as part of a Hollywood style makeover, unless that is what you want. Results are quick and dramatic. At BANGKOK SMILE DENTAL CLINIC @ Sukhumvit 5 our veneers produce very dramatic and almost instant improvements in your smile as, 'before and after' photos clearly demonstrate. The effects this can have on our clients life cannot be under estimated. Having confidence in the way you look and in the way other people perceive you will boost your confidence and make you feel more outgoing and comfortable in the company of others. Also vice versa, other people will see you in a new light. When you look good and exude self confidence people naturally gravitate to you, expanding and enhancing your social standing. 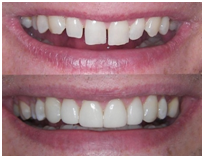 Our porcelain veneers will improve the shape, color and position, minimally, all at once. Therefore if you have a range of cosmetic flaws such as spaces, discoloration, staining, chipped or fractured teeth, these can all be dealt with at the same time. A combined approach using other treatments may be needed depending on the individual requirements of our clients. Unlike full crowns, veneers require the removal of far less tooth structure thus giving the client a more conservative alternative. Because of this they are much less likely to affect the nerve inside the tooth than a porcelain crown. The whole process is far less intrusive and causes much less trauma and discomfort. 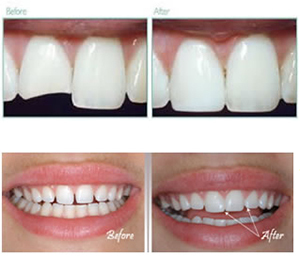 Veneers and other cosmetic treatment combinations. Our porcelain veneers may be used in combination with other treatments such as crowns, bridges, dental implants, orthodontics, teeth whitening, even tooth bonding to achieve a complete smile makeover. The porcelain of a veneer will blend exactly with the porcelain of crowns, implants and bridges if they are made at the same time (i.e. from the same mix of porcelain) to give a perfectly uniform color to your teeth. Assuming of course, that the tooth underneath isn�t so dark it influences the color. At BANGKOK SMILE DENTAL CLINIC @ Sukhumvit 5, dental veneer Bangkok can be used to fix just a few teeth, all the teeth or to mix and match with other treatments to meet your cosmetic desires. For example, after whitening your teeth, you may find that it's only the gap between your front teeth that you wish to fix and just two veneers can give you a great outcome instead of bearing the expense and unnecessary inconvenience of having more extensive treatment. Our experts at Smile Republic are able to advise you of any combined treatment that you may wish to consider. As a client of BANGKOK SMILE DENTAL CLINIC @ Sukhumvit 5, dental veneer Bangkok and once you have made your decision to have veneers custom made at Smile Republic, it�s normally just two or three appointments spaced out over a couple of weeks to achieve a dramatic transformation. With our most advanced technologies and our expert dentists we can complete your treatment quickly, efficiently and unobtrusively. Our clients are always amazed and delighted at how quickly Smile Republic can create such dramatic changes to their smile, and their life, in such a short space of time. After your veneers have been placed and the anesthetic has worn off, if it was required, you are pretty much good to go. The veneers are set firmly to your teeth so you are able to resume normal everyday activities almost immediately, although our BANGKOK SMILE DENTAL CLINIC @ Sukhumvit 5, dental veneer Bangkok experts will advise each client on an individual basis as to any particular procedures they should follow post treatment. At BANGKOK SMILE DENTAL CLINIC @ Sukhumvit 5 our porcelain veneers can be impervious to the classic, everyday stains of coffee, tea, smoking and soft drinks very well and can look as good as the day they were fitted for years to come. 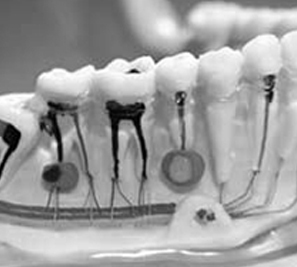 Gums also respond well to porcelain margins making them extremely tolerant and easy to keep clean. Strengthening of teeth and restoration of function. Your BANGKOK SMILE DENTAL CLINIC @ Sukhumvit 5, dental veneer Bangkok will help strengthen fractured teeth and restore them to normal function. Your new veneers will be as close to the strength of your natural teeth as it is possible to get and with our modern bonding techniques, which are second to none, you will have full unfettered function of your new, beautiful teeth. The shape, color and size of the veneers can be chosen by you, within the limits of your mouth structure, to give you the personal smile that you have always desired. Your BANGKOK SMILE DENTAL CLINIC @ Sukhumvit 5 dental veneer Bangkok will require no special maintenance, however our experts can advise you on brushing and flossing techniques should you require it. The BANGKOK SMILE DENTAL CLINIC @ Sukhumvit 5 veneer process. Basically our process is; diagnosis, treatment planning, preparation, and bonding. It is important to note that one tooth or many teeth can simultaneously undergo the veneering process described below. This first step involves active participation between you and our BANGKOK SMILE DENTAL CLINIC @ Sukhumvit 5 cosmetic dentist. Explain to your dentist the result that you are trying to achieve. During this appointment your dentist will examine your teeth to make sure veneers are appropriate for you and discuss what the procedure will involve and what, if any, the limitations will be with the treatment. We also may take x-rays and possibly make impressions of your mouth and teeth. To prepare a tooth for a veneer, your Smile Republic expert will remove about 0.5-1.0 millimeter of enamel from the tooth surface, which is an amount nearly equal to the thickness of the veneer that will be added to the tooth surface. Before trimming off the enamel, our expert will decide whether there is the need for a local anesthetic to numb the area. Next, we will make a model or impression of your teeth. 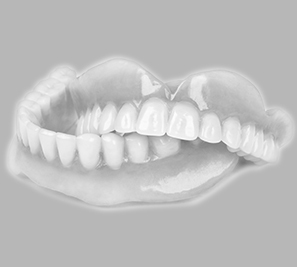 This model is sent to our state of the art in-house dental laboratory, which in turn constructs your veneer. It usually takes 5-7 days to complete this process. For very unsightly teeth, temporary veneers can be placed for no additional cost. Before the veneer is permanently cemented to your tooth by our BANGKOK SMILE DENTAL CLINIC @ Sukhumvit 5 expert we will temporarily place it on your tooth to examine its fit and color. We will repeatedly remove and trim the veneer as needed to achieve the proper fit, the veneer color can be adjusted with the shade of cement to be used. Next, to prepare your tooth to receive the veneer, your tooth will be cleaned and polished which roughens the tooth to allow for a strong bonding process. A special cement is applied to the veneer and the veneer is then placed on your tooth. Once properly positioned on the tooth, our expert will apply a special light beam to the veneer, which activates chemicals in the cement causing it to harden or cure very quickly. The final step involves removing any excess cement. Our BANGKOK SMILE DENTAL CLINIC @ Sukhumvit 5 experts are very exacting, and so, will also evaluate your bite and make any final adjustments to the veneer as necessary. Our Smile Makeover "INSTANT ORTHO PROGRAM"
At BANGKOK SMILE DENTAL CLINIC @ Sukhumvit 5 we also offer an alternative to porcelain veneers. Resin veneers offer an extremely affordable ulterior option which will produce quick, durable and aesthetically pleasing results Resin veneers. Resin veneers are essentially a reinforced plastic option, which is used in the same way as porcelain and is more affordable. At BANGKOK SMILE DENTAL CLINIC @ Sukhumvit 5 we have embraced the advances in technology within cosmetic dentistry and composite resin veneers have improved immeasurably. Resin veneers are now extremely durable and resistant to the effects of modern day life. However, resin veneers are more susceptible to chips thus, it may be necessary for the veneers to undergo repair work. Composite resin veneers are also very slightly porous and so can be vulnerable to staining if thorough cleaning and flossing is not undertaken regularly. It may also be the case that, depending on your lifestyle, resin veneers may not last as long as porcelain, so repair or replacement work may become necessary sooner than it would with porcelain veneers. Are there advantages to resin veneers? In short, yes. Resin veneer treatment from BANGKOK SMILE DENTAL CLINIC @ Sukhumvit 5 is a very quick alternative to porcelain, often you will only require one visit to BANGKOK SMILE DENTAL CLINIC @ Sukhumvit 5 to complete the process. The color and shape options are similar to that of porcelain, within the limits of your mouth and tooth structure. The results of resin veneer treatment is instant so your new dazzling smile is noticed and can be enjoyed immediately. If cost is an important factor for a client then resin veneers offer a very economical alternative to porcelain whilst still giving stunning results. How do I decide which is the better choice for me? Don�t worry. Our experts at BANGKOK SMILE DENTAL CLINIC @ Sukhumvit 5 will discuss and advise you on the choices available on a case by case basis leaving you to make an independent and informed choice. Whichever process you decide upon our Smile Republic experts will deliver a professional and conscientious service creating a result of which we will be proud, and with which you will be delighted. Am I good candidate for dental veneers? Dental veneers are not appropriate for everyone or every tooth. At BANGKOK SMILE DENTAL CLINIC @ Sukhumvit 5 we believe case selection is an extremely important factor in the success of this technique. Veneering teeth is not a reversible procedure if tooth structure must be removed to achieve your desired result. - Unhealthy teeth. Dental decay and active gum disease must be treated prior to fabricating and bonding veneers. - Weakened teeth. If a significant amount of tooth structure is missing or has been replaced by a large filling the teeth will not be strong enough to function with a veneer. - Teeth with an inadequate amount of enamel present. Dental veneers are more successfully bonded onto tooth enamel. - People who habitually clench or grind on their teeth. Habitual clenching and grinding of the teeth can easily chip or break veneers. 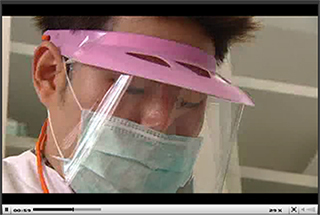 Dental night guards may be a solution for this in some cases. treatmentPersons without a stable bite. 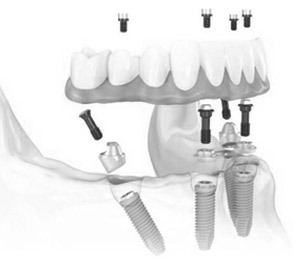 - Severely malpositioned or misaligned teeth. Orthodontic treatment may be required to achieve the desired result. BANGKOK SMILE DENTAL CLINIC @ Sukhumvit 5 Bangkok. Visit us at BANGKOK SMILE DENTAL CLINIC @ Sukhumvit 5 dental veneer Bangkok and the route to your perfect smile will begin, with our skill and expertise the route is smooth, friendly, unobtrusive and dramatic. Our experts are the most highly trained in Thailand, our equipment and techniques are the most up to date available. The smooth cohesion of all these factors means there is no better quality and financially comparable experience available anywhere. Our clients are led by our incomparable reputation, we are led by our clients satisfaction and desires.